The Hidden Slot by ELK Studios is beautiful video slot with five reels and four symbols each on the reels. 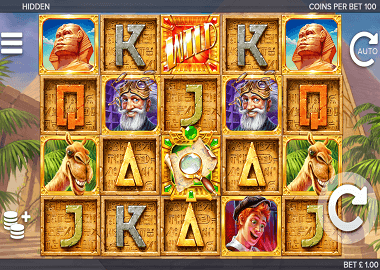 The game is a “Ways to Win” slot that means you will not win at certain paylines. Your symbols just have to land side by side on the reels. ELK Studios has prepared 178 ways to win for you and all you have to do is play the game for free here. As usual, there is also a little story in the game. The Hidden Slot is about an intrepid explorer and his young side kick on an expedition in Egypt. Of course, the icons were designed to fit this theme. Symbols, Wilds and Scatters: The symbols in Hidden Slot look like the blocks from which the pyramids were built in Egypt. The themes related symbols are the old explorer, his young buddy, a camel and a statue. The low paying symbols are 10, J, Q, K and Ace. The old explorer is the best symbol in the base game. You win the 1000x bet in a 5 combination. His side kick also pays 500x your bet. The magnifying glass symbol is your scatter symbol. The hidden slot also has a wild symbol and this replaces all symbols except your scatter. Flash Back Re-spins: ELK Studios is a very young little company developing their wonderful games in Stockholm. The programmers and designers are known for their innovative ideas. So it is with the Hidden Slot, because this one has the Flash Back Re-spins feature. You are able to triggered the re-spins in between normal spins. Up to three of the middle reels are covered by sticky wilds and they remain for three re-spins! Free Spins Feature: The bonus round or free spins feature is triggered with three magnifying glass scatters. You get one random symbol at the start of the bonus round. This is your feature symbol and this expands after every spin to a 2×2 symbol. For your three scatters you get first 5 free spins, but with every magnifying glass symbol you get one more free spin within the feature. All non-expanding symbols explode and you get new symbols – hopefully with more of the feature symbols and a potentially nice profit. ELK Studios does not have a large selection of slots like Playn’Go, Quickspin or Novomatic. The slots are very special and you cannot find them in many online casinos. Just like the slots, ELK Studios selects its partners very precisely. Find out more about ELK Studions here and we also have a nice selection of free ELK slots. You can also play the Hidden slot here if you click on the slots banner above. If you want to play for real money, Spin Rider Casino is a great recommendation. You not only find ELK Studios slots there, but also a wonderful bonus and 50 free bonus spins!